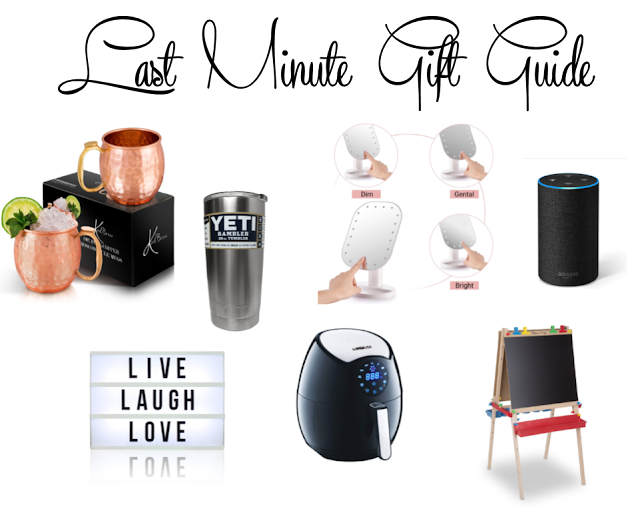 So I haven't done a gift guide on the blog in a few years but I thought it might be kind of fun to do a last-minute gift guide as I am sitting here on Amazon Prime ordering the last of what I need for this years haul. I am not a last minute shopper at all, I got most of my shopping done the first week of December, but I do have a few odds and ends I needed to grab and I thought it might be fun to do a quick post for any of you who are still finalizing your gifts with less than a week left! If you're not on Amazon Prime I'd highly recommend it, I buy everything from Amazon, it's so easy on convenient and fast! So everything here will be linked to Prime products which you should have by Wednesday if you're ordering today! Amazon Echo - Currently 20% off and comes in some really amazing colors. If you're not familiar with the Echo, it can do so much--make calls, play music, play audibooks, news, control your TV, order a pizza, request an Uber, even tell you a joke! It's on sale now, in stock, & arrives before Christmas! Melissa & Doug Deluxe Standing Easel - Currently 35% off at $51.99 and perfect for mostly any child! In stock & arrives before Christmas! Yeti Rambler - Everyone loves Yeti stuff, this stainless steel 20oz. Rambler travel mug is perfect for just about any man or woman in your life, you can do hot and cold in it, it's not just for coffee drinkers! It's currently 24% off! I like that these are BPA free & can go in the dishwasher! LED Make Up Mirror - I have been dying for one of these! This one is currently on sale for $26.99 which is 18% off, in stock, & arrives before Christmas! I've seen some of these going for $150 on other sites, definitely not willing to pay that! Lightbox - fun for ALL ages, this lightbox in particular is currently 40% off and going for $14.99 with Prime! You can also buy fun emoji and add on sets to make these even more cute and colorful! I definitely feel like these are such cute gift idea and have had my eye on one for awhile. Air Fryer - have you guys seen these or do any of you use one? I have yet to purchase one but it's also on my list of items I need! You can save yourself tons of calories with these cooking things like french fries with air rather than with oil! I have heard amazing things about these! Moscow Mule Cups - everrrryybody loves a good Moscow Mule, or any of the other varieties of mules there are out there. A good set of copper cups is must for any mule connoisseur. Love the price of these, practically getting 2 for the price of one! If you're still in the market for some Christmas presents I think this list has some pretty good stuff for some pretty great prices. I never have been a last minute shopper but now that I have a child it seems like things tend to get done more "last minute" than they ever have before. Are you an early shopper or last minute shopper? Or are you a REALLY last minute shopper who buys gifts on Christmas Eve?